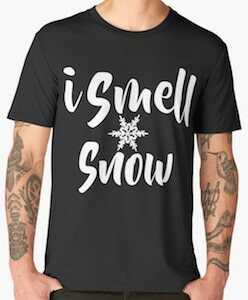 If you like winter and snow then you just need this I smell snow t-shirt. On the t-shirt you can see a big snow flake in the middle and around the flake of snow it says “I Smell Snow”. 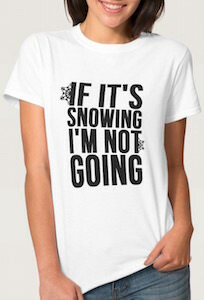 It is the perfect t-shirt for winter and for people like me that just love snow no matter what time of year. You can get this snow t-shirt in sizes Small – 3XL and comes in different color and even in different styles. And you like snow but would like to be warmer this winter then you can even have the design on a hoodie. If snowboarding is your way to burn off that excess energy then this t-shirt is just perfect for you. This t-shirt is available in styles for both men and women and is available in sizes Small – 5XL and in many colors and it is even available as a hoodie. 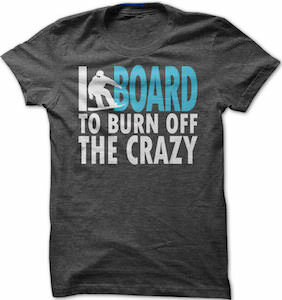 On the t-shirt, you can see a snowboarder and the text “I board to burn off the crazy”. A t-shirt like this is great for when you go out in the snow but also great for a day at work so that people know why you behave the way you do. 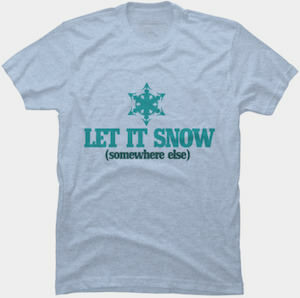 Men, women or kids that do not like snow should check out this t-shirt. On the t-shirt you can see a snowflake and below it the text “Let Is Snow (somewhere else)” and that of course is funny and perfect for you. You can get this t-shirt in many colors and styles for the whole family. It would also be great to wear t-shirt with the group of friends that you go on your winter holiday with because that will get some people look confused when you wear it. This women’s t-shirt is white as snow and but it is warm when you wear it. On this white t-shirt it says “If It’s Snowing I’m Not Going” and that is a clear message. So if you really don’t like snow then this is the t-shirt to wear but I kinda hope you change your mind and still wear this t-shirt when going to the snow just to see the faces of people reading the shirt. You can get this snow t-shirt in sizes Small – 3XL and it is made from 100% cotton and you can even get it in different colors but I think snow white is the way to wear it. Look to the south west of Tokyo on a clear day and see the tallest of three holy mountains of Japan. A snow capped peak is all that is needed on this short sleeve t-shirt to know what it represents. You will also find the 3 Japanese symbols on the left chest that read Mount Fuji. That’s it, that’s all. Simple, yet straight to the point. This unisex t-shirt comes in a full size run starting at an Extra Small which is small enough for a petite woman. It also comes in over 20 colors to make it hard to resist. 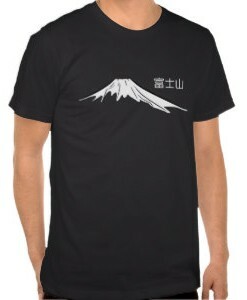 Feel your inspiration through the Mount Fuji Snow Capped T-Shirt. This t-shirt with Mickey is available in long and short sleeves as the winter could be to cold for short sleeves. And as you can see on the picture above Mickey Mouse is not cold he is wearing gloves and a scarf and even a Santa hat. Mickey is getting ready for Christmas and he is almost done and to get a white Christmas he got some snow or actually he only got one snowflake but it is almost as big as himself and that is why he is hanging against it. So if you would like a Mickey Mouse Christmas t-shirt then you should check this one out as it is available for adults and kids in all kind of styles and colors. 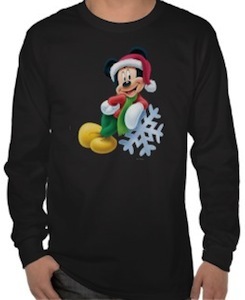 Get ready to have Disney Christmas with this Mickey Mouse And The Snowflake T-Shirt. This is a fun shirt that comes in tons of different colors and styles. You have to admit this is a laugh out loud t-shirt that will make people smile and it is always fun to make people smile. 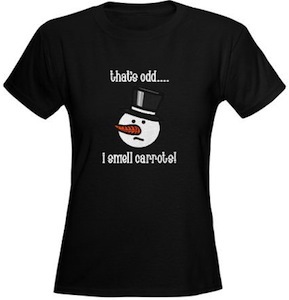 Just come and see all the options of this Snowman I Smell Carrots T-Shirt. Winter brings snow and snow will make you want use it. Snowboarding is the way to move and this t-shirt shows a nice red and blue picture with a white Snowboarder on it and below that the word snowboard. A great t-shirt for everyday or just for after a nice run down a snow covered mountain. 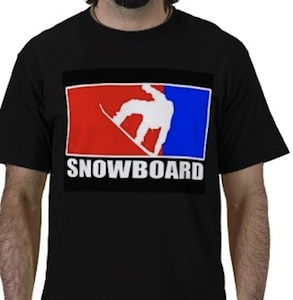 Get your own Snowboard T-Shirt. WOW this skier does his own stunts lets hope he doesn’t break anything. If you are like this fellow or know people that like to break bones then this is the T-shirt to get. This “I Do My Own Stunts” T-shirt comes in all kind of cool colors so that it will always find a space in your wardrobe. 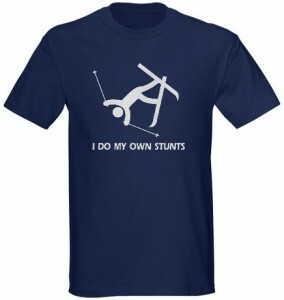 Have a look at this I Do My Own Stunts T-shirt.